A contemporary morality tale of uprising- let the beggars have their say! The national tour of the most pioneering production of Brecht and Weill’s The Threepenny Opera, which is as topical now as it was 85 years ago. At a time of financial insecurity and grinding poverty, never has there been a more relevant time for a fresh exploration of society’s reaction to surviving economic hard times, and allowing the social under-dogs to have their say. This beggars’ opera, a story of the dispossessed and the downtrodden, will resonate across modern British society. 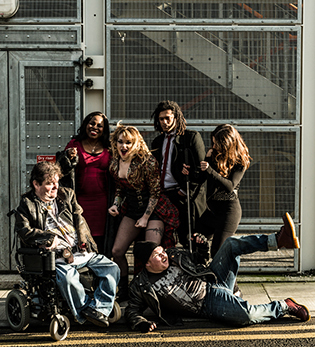 Teaming up with Graeae, the UK’s foremost disabled led theatre company, this five-way co-production will be the first fully integrated production of Threepenny Opera ever performed. Using audio description, a creative combination of BSL interpretation and captioning and an integrated cast of disabled and non-disabled performers, the co-directors, Peter Rowe and Jenny Sealey will bring their unique combination of theatrical passion to this modern classic. The London 2012 Paralympic Games opening ceremony, (co-directed by Jenny Sealey), provided a global platform for the skills and talent of deaf and disabled artists, and this brand new production of The Threepenny Opera will endorse the claim that the UK is now a world leader in promoting diversity in the arts. With live music played onstage by the actors themselves, delivering a score that includes such well-known songs as Mack the Knife and Pirate Jenny, expect a riotous musical comedy that audiences will be begging to see!